Dutch delftware is an iconic product often regarded as a symbol of the Netherlands' seventeenth-century Golden Age. Yet little of it is ever on show in Dutch museums. As the owner of one of the biggest and best collections anywhere in the world, the Gemeentemuseum in The Hague is an exemption. The permanent exhibition Delftware Wonderware, comprising over 235 items, is a dynamic presentation that gives a unique view of the Delftware industry through the ages. The highlights of the collection include a number of tulip vases. These impressive pieces, with spouts to hold tulips, were a fusion of Eastern and Western forms, decorative motifs and Asian porcelain. The permanent presentation in the period rooms gives visitors to the Gemeentemuseum 'flesh-and-blood' access to the product's fascinating 400-year history. Exhibits include everything from the well-known 'Blue Delft' to gaudy multi-coloured examples and range from simple plates to intriguing tulip holders - and even a modern Miffy moneybox. In addition, an installation shows how even contemporary designers find inspiration in this major cultural legacy of the past. 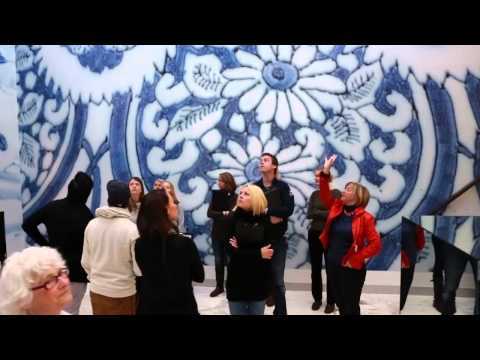 Dutch delftware is as close to our hearts as ever it was! The Dutch East India Company (VOC) started shipping Chinese porcelain to the Netherlands in the early seventeenth century. The shiny surface, amazing decoration and exotic shapes of the new ceramics captured the public imagination but only the wealthy could afford to buy them. The existing Delft earthenware industry took up the challenge and strove to produce pottery that looked exactly like oriental porcelain. The sophisticated and luxurious product that resulted was seen as the best possible alternative to the genuine thing. It was even referred to as Delft 'porceleyn'. By around 1660, when Vermeer painted his famous View of Delft, the town had a multitude of potteries and in the late seventeenth and early eighteenth century Delft was the undisputed world leader in the production of this tin-glazed earthenware or 'faience'.